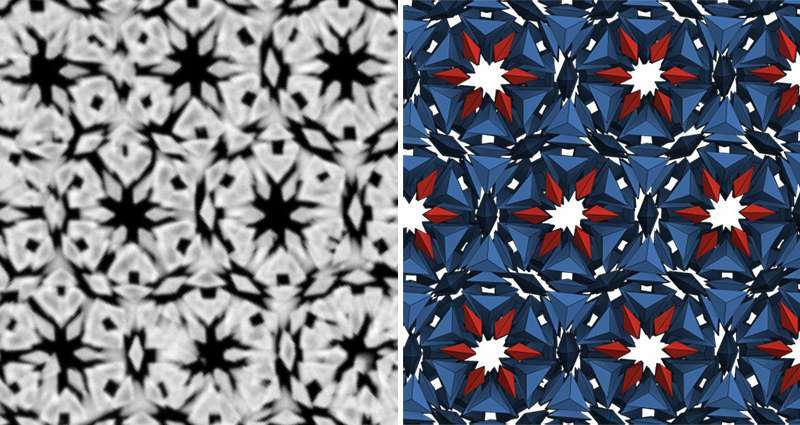 The most complex crystal designed and built from nanoparticles has been reported by researchers at Northwestern University and confirmed by researchers at the University of Michigan. The work demonstrates that some of nature's most complicated structures can be deliberately assembled if researchers can control the shapes of the particles and the way they connect. "This is a tour de force demonstration of what is possible when one harnesses the information content and chemistry of DNA and combines it with nanoparticles that are one size and one shape," Northwestern's Chad A. Mirkin said. Mirkin is director of the research group that discovered such materials and a pioneer of the concept of programmable colloidal crystallization with nucleic acids. He is the George B. Rathmann Professor of Chemistry in the Weinberg College of Arts and Sciences. Nanotechnology promises to bring materials together in new ways, forging new capabilities by design. In 1996, Mirkin introduced the concept of using nanoparticles as atoms and synthetic DNA—the blue print of life—as a chemically programmable bond to make designer materials based upon the ability of the particles to recognize one another through sequences immobilized on their surfaces. One potential application for crystals built of nanoparticles, such as these newly reported ones, is the control of light—nanoparticles interact well with light waves because they are similar in size. This could lead to materials that can change colors or patterns on command or block certain wavelengths of light, while transmitting or amplifying others. New types of lenses, lasers and even Star Trek-like cloaking materials are possible. "We can build these complex building blocks that enable researchers to make materials that you can't get naturally out of atoms and molecules," said Sharon Glotzer, the Stuart W. Churchill Collegiate Professor of Chemical Engineering at U-M. She led the U-M portion of the study. In chemistry, clathrates are known for their chambers that can house small molecules. They have been used for capturing pollutants from the environment, for example. The nanoparticle clusters also leave room for cargo, which Mirkin suggests could be useful for storing, delivering and sensing materials for environmental, medical diagnostic and therapeutic applications. While natural materials exhibit a dizzying array of crystal structures, most nanotechnology labs struggle to get past cubic designs. The structures produced by Haixin Lin, now a postdoctoral fellow in Mirkin's lab, are far superior. The new structures formed in clusters of up to 42 particles, sketching out complex polyhedra such as the great dodecahedron. These clusters then connected into cage-like crystal structures called clathrates. Still, the story isn't the crystal itself: it's how the crystal was made and characterized. Mirkin's group has pioneered many structures through the use of DNA strands as a sort of smart glue, linking nanoparticles together in a particular way. The particle is both a building block and a template that directs bonding interactions. Meanwhile, Glotzer's group has championed the role of nanoparticle shape in guiding the assembly of crystal structures through computer modeling. "Chad's group got the idea of exploring new phases by looking at predictions we had made," said Glotzer, the John Werner Cahn Distinguished University Professor of Engineering. "One day, I got a phone call from Chad. 'We just got these incredible structures!' he said. And he texted me micrograph after micrograph—they just kept popping up. He said we need to figure out a way to definitively assign their structures." The electron microscope images showed clathrates that formed in large part thanks to the shape of the gold nanoparticles. The bipyramidal shape, like two flattened pyramids stuck together at their bases, was naturally inclined to assemble into clathrate structures. But to do so, they needed strands of DNA attached to their sides at just the right length. When too short, the DNA strands made disordered, ill-defined structures, while longer sequences allowed the clathrates to form. Lin systematically made the gold bipyramids with edge lengths of 250 nanometers—half the wavelength of blue light. He then modified them with different length sequences of DNA to determine the most optimized construct for forming the observed crystalline structures. When he saw the exotic patterns in the electron microscope images, he brought them to Mirkin, who was both thrilled and intrigued. 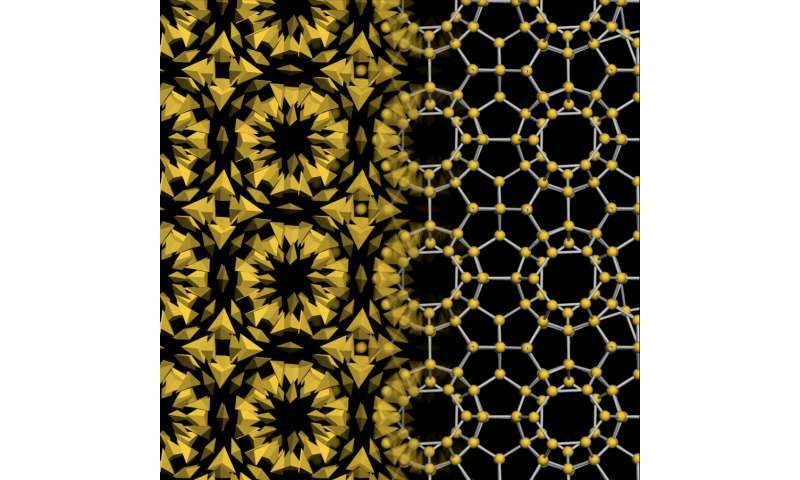 "These are stunning—no one had made such structures before," said Mirkin, director of Northwestern's International Institute for Nanotechnology (IIN). It was clear they had made phases never observed before, but getting the structure accurately assigned was essential. After Mirkin alerted Glotzer, Sangmin Lee, a doctoral student in chemical engineering, and Michael Engel, a postdoctoral fellow, both at U-M, 3-D printed bipyramids and assembled them to explore how they might make the shapes in the electron micrographs. Then, they and their coworkers built a computer model to confirm that the DNA-linked nanoparticles would indeed form clathrate structures. "To really know for sure, we had to make a simulation where you have the shapes, you put in the DNA interaction and both build the thing and see if it's stable in the computer," Glotzer said. "We also just threw the particles in a box to see if they self-assembled under the same kind of conditions they used in the lab."